This new plugin provides a number of new features and important fixes. 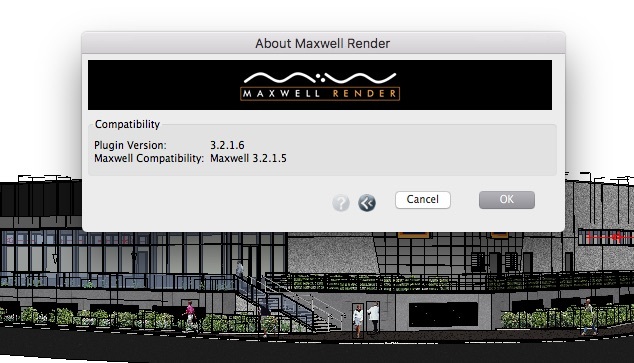 It requires the latest Maxwell Render Suite, version 3.2.1.5. This update requires an activation which I haven't been able to do since my license is already being used (same computer). I'm not entirely sure what you mean by your description. If you replace the copy of Maxwell on your computer with 3.2.1.5, it should run as before. However, if you used the uninstaller and chose the 'remove license files' option, you might need to do the licensing procedure again. i am having licensing issues with my 3.2.1.6 plugin. maxwell app latest 3.2.x release runs perfectly, but the plugin continues to ask for a licence activation. i have a floating suite license and an rlm server on a networked mac set up and running. not sure what the issue could be? Hmm. I have a floating license served from a Mac and have not had any issues with 3.2.1.6. I suspect that RLM thinks more licenses are checked out than you have available through your floating license. I would suggest restarting all the machines that use Maxwell/formZ, and then stopping and restarting the RLM server. Does the problem persist after that? restarting all macs a second time did help indeed! thank you! I'm having a bit of a panic here Pylon. I installed the latest builds of Maxwell and the plugin this morning. Now the plugin won't work, it says it's not licensed. Latest version of Maxwell 3 and Plugin for Z. When I launch the license activator and insert my info, I'm asked to add to or overwrite the existing license, which ever I choose is accepted, but when I return to the plugin in FormZ I get the same "Maxwell is not licensed" message. Is there a manual way of placing the license file? If I turn on the firewall it doesn't work.... so my system (small as it is) has to be vulnerable to use maxwell? I'm not a license specialist, but I would recommend enabling your firewall, but making sure that formZ is allowed to accept incoming connections in the Security & Privacy > Firewall pane. (RLM needs to communicate with formZ.) Does that help? Thanks for getting back Pylon. I've enabled RLM, Maxwell & FormZ to accept incoming connections, but still no joy when firewall is on. I suggest you open a help ticket with Next Limit- they are the RLM experts! I have been having serious issues with Maxwell after updating to Sierra and in this thread I'm seeing reference to 3.2.1.6... but on my Nextlimit download area the most current version for V3 is 3.2.1.5... is there another location to get an updated maxwell installer? I see others are having the same issue as me. I just installed Maxwell and activated it. Z keeps telling me it isn't registered though. I tried connecting to the internet in various ways. I have no firewall. The RLM server is running on and old second Mac mini, same as before I changed my work laptop. There was a licensing problem with the last Maxwell 3 for formZ plugin that has since been corrected. Please log into the Maxwell Render customer portal, and download the latest Maxwell 3 for formZ, version 3.2.1.7. This should fix the issue!